It was 1914 when the doors of the Diamondville Blacksmith shop opened in the southwestern coal mining area of Wyoming. As automobiles became more prevalent it was only natural that car repair became a regular part of the business. We did a lot of spring work then, those roads were rough and hard on cars. During prohibition this area was quite noted for making moonshine. We'd add a couple of leaves and arch the rear springs so empty, the car went down the road like you kids raise a car now. When it had a load of whiskey the car rode level. Later we improved on this version and made an overload spring that fit over the rear housing and attached with straps to the main spring. This way the car would ride level when empty and the overload springs would pick up the weight when full. The Revenuemen couldn't tell the cars were equipped to carry moonshine at all. The earlier days were more exciting than now and all kinds of ploys were used to sell cars. Star cars were noted for the Durant tubular backbone, a four-foot piece of pipe that doubled as the muffler and gave the chassis added strength. The Star had a reputation of being able to be driven on three wheels and you could do it, but there was a trick to it. You took off the right front wheel and made sure nobody sat in the front passenger seat. Then you put two or three people in the back seat and a big strap around the rear axle to hold it to the frame so the car wouldn't tip over. People actually thought that if you lost a wheel you could keep on going. Another interesting demonstration was to show the power of the Star car. With the horse still a very popular, any demonstration proving the car better than the horse would certainly impress the spectators. You'd go into a ranching town and offer to out pull any team they had. When the team and the car were hooked back to back and the rope taught the, driver of the car always made sure he popped the clutch. The jerk of the car pulled the team off balance and from then on it was easy. An average of about twenty cars were sold annually until 1930 when only four were sold; the last one being a 1930 model 6-14 which was left on the floor and sold In 1931. With the Depression, people just couldn't afford a new car so there was always a lot of repair work to be done. We got our cars from the Inter-Mountain Motor Car Company until they were replaced by the Freed Motor Car Company, which is still in business in Salt Lake City as a Chrysler Dealership. One time we sold a Star to a miner who traded in a Model T Ford for it. The next day we got a call that the clutch was out or that the rear-end was stripped, as he couldn't get the car to move. Our mechanic packed up his tools and drove sixteen miles over a rough dirt road to Cumberland Camp to repair the car. The old miner got in and was pushing the clutch and brake pedals and cussing' like hell because the car wouldn't go. He forgot to put the car in gear with the shift lever. Here like most every place when horses were the way to go someone who just started to drive would get befuddled and forget you had to push in the clutch and the brake to stop. You'd see them hanging onto the steering wheel crashing into a fence or building yelling, "Whoa you S.O.B. Whoa." 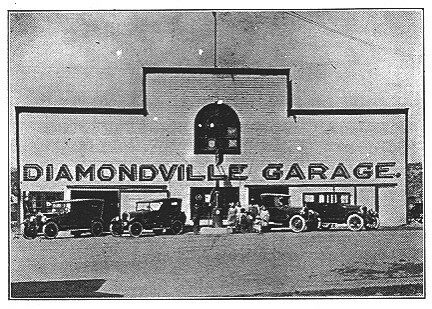 The Diamondville Durant agency is just a memory now, but the building still stands almost the same as in the picture Chat was taken about 1925. When the wind blows it creeks and groans like an old sailing ship.